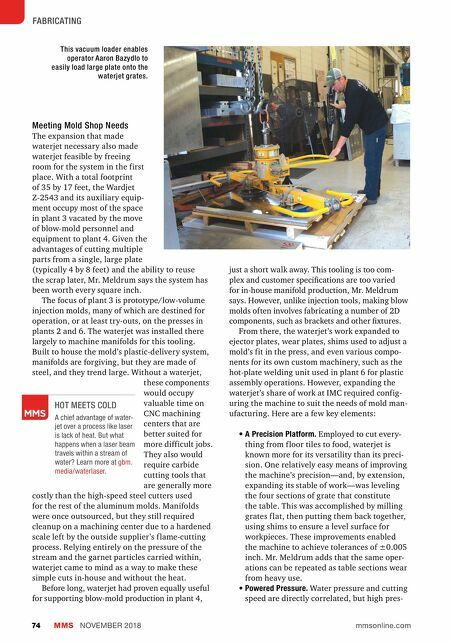 Waterjet Modern Machine Shop 75 sure alone is not enough to cut steel and alu- minum at the rates required by IMC. After all, the Hypertherm hydraulic intensifier pumps that come standard on Wardjet machines can achieve 60,000 psi at power ratings as low as 30 horsepower, according to data on the company's website. However, a lower-pow- ered pump can push only so much water (0.6 gallon per minute at 30 horsepower). Maximum pressure can be achieved only by forcing the water through a relatively small orifice (0.011 inch), after which the stream is imbued with abrasive and exits the nozzle. At the same 60,000-psi limit, IMC's 75-horse- power pump can drive 1.5 gallons per minute through a 0.016-inch orifice. This is sufficient to reliably maintain the aforementioned ±0.005-inch tolerances in 3-inch-thick steel at 0.4 ipm or 7-inch-thick aluminum at 7 ipm (and in both materials, thicker work than this can be cut, albeit more slowly and carefully). • Efficient water treatment. 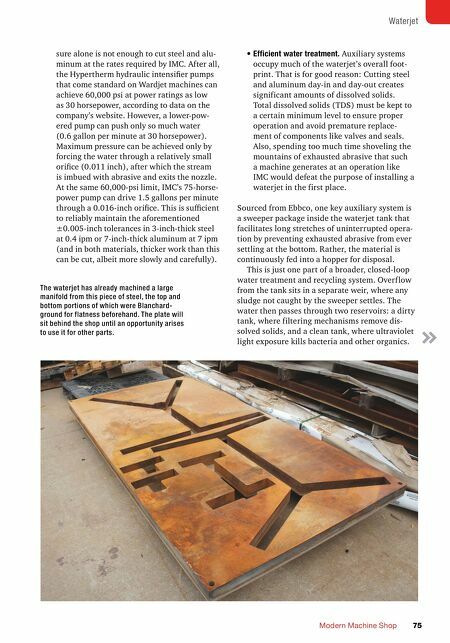 Auxiliary systems occupy much of the waterjet's overall foot- print. That is for good reason: Cutting steel and aluminum day-in and day-out creates significant amounts of dissolved solids. Total dissolved solids (TDS) must be kept to a certain minimum level to ensure proper operation and avoid premature replace- ment of components like valves and seals. Also, spending too much time shoveling the mountains of exhausted abrasive that such a machine generates at an operation like IMC would defeat the purpose of installing a waterjet in the first place. Sourced from Ebbco, one key auxiliary system is a sweeper package inside the waterjet tank that facilitates long stretches of uninterrupted opera- tion by preventing exhausted abrasive from ever settling at the bottom. Rather, the material is continuously fed into a hopper for disposal. This is just one part of a broader, closed-loop water treatment and recycling system. Overf low from the tank sits in a separate weir, where any sludge not caught by the sweeper settles. The water then passes through two reservoirs: a dirty tank, where filtering mechanisms remove dis- solved solids, and a clean tank, where ultraviolet light exposure kills bacteria and other organics. The waterjet has already machined a large manifold from this piece of steel, the top and bottom portions of which were Blanchard- ground for flatness beforehand. The plate will sit behind the shop until an opportunity arises to use it for other parts.